Lhikan was a Toa of Fire who led the Toa Mangai and defended the city of Metru Nui before he sacrificed his power to create the Toa Metru. As a Turaga, Lhikan continued to mentor Vakama and the other Toa, until he sacrificed himself to protect Vakama from an attack by Teridax. The Toa Metru honoured Lhikan by naming the ships they used to transport the Matoran from Metru Nui to Mata Nui after him, giving his mask to Jaller, and telling the Matoran legends of a lava surfer named Lhii. 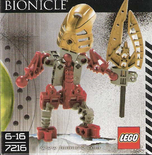 The identity of the figure in 7216 was kept ambiguous for years, though fan theory often speculated that it was Turaga Lhikan, until Greg Farshtey confirmed this in 2014. This is a description taken from Biomedia Project. Please do not modify it. 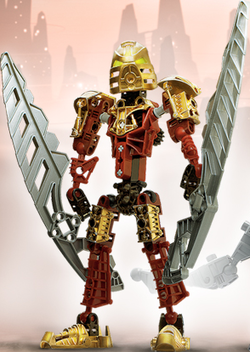 (see an archive of the product's page) Toa Lhikan, guardian of Metru Nui before the coming of the Toa Metru, carries two lava greatswords that can be combined to form a flying board or a shield. The Kikanalo is a mighty herd animal, whose stampedes are feared even by the evil Dark Hunters.